"Gimme Shelter" starts with a lot of promise. We see shots of a gritty New York not often seen in films today: rattling above-ground subway lines, tenements, dank hallways filled with noise and chaos. Over the urban landscape shots, we hear a whispering female voice, "I'm not scared. I can do this. I'm okay." Vanessa Hudgens, fully separated now from her "High School Musical" persona, having taken gritty almost feral roles in "Sucker Punch," "Spring Breakers," and "Frozen Ground", stands in a cramped bathroom, chopping off her black hair, whispering those words to herself. Her words will come up again as her character, Apple, makes a run for it, out of the life handed to her, into a life she created. "Gimme Shelter" has an episodic structure that gives a monotonous "and then this happened, and then this happened" feel to all of the hardships that Apple encounters. There are car crashes and locked shelter doors, uncomprehending social workers and screaming families. Father McCarthy, a kindly priest played by James Earl Jones, hovers around Apple, shining his benign light. 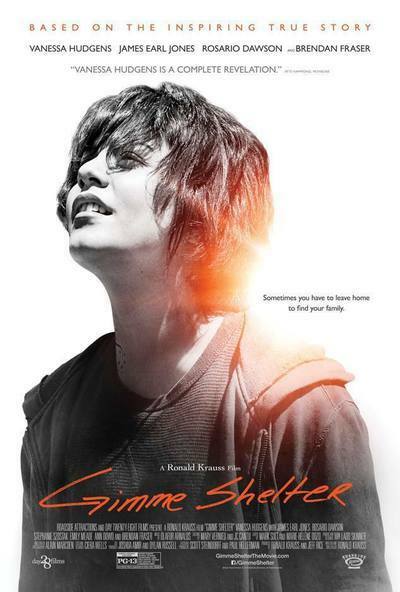 Based on a true story, "Gimme Shelter" ultimately is about the work of Kathy DiFiore, who created Christian shelters for pregnant teens who want to keep their babies. The scenes of Apple in the shelter all the other pregnant girls are the film's best, but the shelter doesn't appear until halfway through, Krauss having decided for some reason to hold it back. What this does is it makes the shelter seem like a sub-plot, or another "and then this happened" episode, when it is actually the point of the whole thing. Aside from James Earl Jones and a baffled and uptight Brendan Fraser, Vanessa Hudgens is the only "name" in the film. She is in every scene. She carries the action. Like the famous "women's pictures" in the 1940s, "Gimme Shelter" is interested in the up-and-down journey of its lead female character: her struggles and triumphs, failures and flaws. Every detail here is right. The piercings on Apple's nose and lips look infected, her skin is blotched and pimply, and when she gets a chance to eat, she shovels the food in her mouth like a wild animal. Apple has been "in the system" since her earliest days, she has been abused and raped and molested, and the "system" kept shoving her back into the pit. Her mother, played by an almost-unrecognizable Rosario Dawson, was "born in the streets", she has rotting yellow teeth, bruises on her legs. The "system" keeps trying to re-unite Apple with her mother, against Apple's clear wishes. But Apple is still a minor. In the opening scenes of the film, Apple escapes from her mother's clutches and makes her way to New Jersey to track down the man who is her biological father (Brendan Fraser), a man she has never met. The man now lives in a Daddy Warbucks-level mansion with his wife (Stephanie Szostak) and two kids, and they try to adjust to the advent of Apple, who is rude and sullen, with atrocious table manners. When it becomes obvious that Apple is pregnant, Mrs. Daddy Warbucks takes her to a clinic to get an abortion. Apple stares at the ultrasound pictures, deciding whether she wants to keep the baby. She needs shelter, of course. Kathy DiFiore is a character in the film. She's played by Ann Dowd, in a powerful and compassionate performance that doesn't look like acting. She seems like a real person. She has a sense of mission towards the unborn babies under her care, as well as to the girls who live in her house. The girls in these scenes are wonderful, anonymous, they seem to have stepped right off the streets. Their interactions feel improvisational and fresh.While there is some bickering, none of it gets too harsh. For the most part it is a supportive family atmosphere. The couple of scenes between Dawson and Hudgens vibrate with pain and ugliness. The script is often obvious, with all feelings laid out too cleanly, but both actresses still manage to create a jagged relationship based on their characters' codependence and shared traumas. One of the film's strengths is its portrayal of the "system" and what it does to abused children, and the layers of bureaucracy that make it hard to bring about meaningful change in people's lives. There's a reason the Christian media has been following this film closely. The religious aspect of "Gimme Shelter" is right out on the table, once the kindly priest shows up, but it's undercut by the grubby and warm reality of those girls in the shelter. There are some scenes where the girls grumble to one another at being made to collect donations in local churches, and be trotted out as success stories of living in the light of Jesus. The film never says the words "pro-life" or "pro-choice." It genuinely seems to be about how the system has broken down entirely, and how sometimes it is up to privately funded charities to provide a light at the end of the tunnel. 30 Minutes on: "Straight, No Chaser"
Venice Film Festival 2015: "Black Mass"